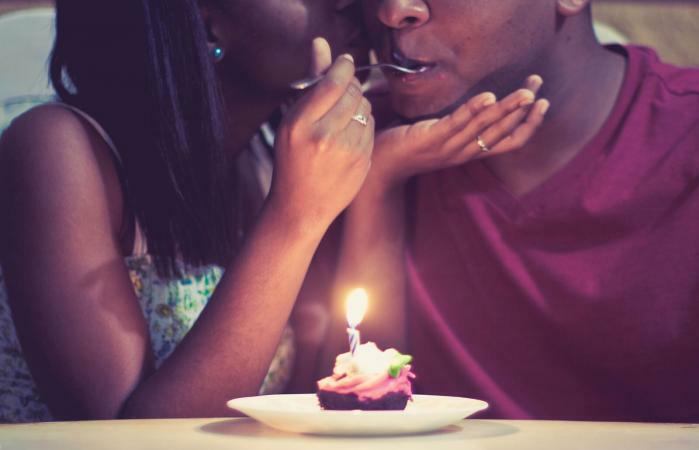 Use these ideas to help you plan a romantic birthday. They are only suggestions, however. Use your knowledge of your partner to pick an activity he or she will truly enjoy. If it's a woman's birthday, a romantic birthday idea for her often starts with flowers. She is unlikely to consider it romantic without them and may even be a little disappointed if she doesn't receive flowers. Roses are good, but they aren't the only flowers. Pick out a different arrangement for some variety. Consider having the flowers sent to where she works so she can enjoy them and show them off to her friends. Give your lover a romantic display that publicly shows off your feelings and lasts year after year. Choose a spot in front of his or her house or use window boxes if they don't have a yard. Plant flowers or greens that symbolize love your you know your partner enjoys. Add in garden decorations that feature hearts, the word "love," and little signs where you can write love notes. This is especially a good idea if the two of you have been together for a while; it's a great thing to do on your birthday with your boyfriend, no matter who is doing the planning. Visiting the place where you had your first date (or first kiss) will bring back all those pleasant memories of when you first started getting to know each other. This idea will take some research but your birthday guy or gal will really appreciate it. Talk with his or her friends or parents to find a place that will be meaningful. It might be a visit to an old school or house, or maybe a trip to the park, beach, etc. What you are looking for is a place that is special to your partner that he or she hasn't visited in a while. Take your partner to a major sporting event for a team he loves and surprise him with a message on the scoreboard to make it a romantic birthday for him. Check with the team's marketing personnel ahead of time to find out how you can buy a written message or guarantee the two of you get on the jumbotron. 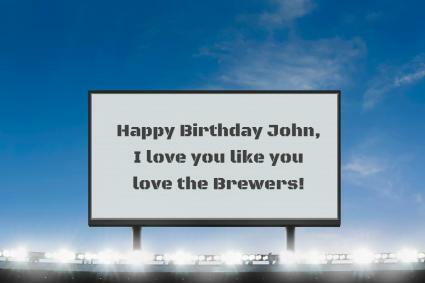 Teams like the Milwaukee Brewers sell messages on their scoreboard for $100 to $250 as a fundraiser. Chances are you will give a birthday card. Spice it up a little and write things you love or appreciate about your partner. Your words will be so much more special than anything Hallmark writes. Create loving works of art by decorating picture frames with hearts or your pet names for each other, writing the lyrics to your song on photo frame matting, or painting love notes on large canvases. Whatever type of art you choose to make, be sure it features colors, pictures, or words your lover will appreciate. After you create the art, hang it around the house when your lover is away as a romantic birthday surprise idea. Many spas have special couple treatments. You'll be in the room together when you receive your massages. You can even hold hands or look into each other's eyes. If you can't afford a spa treatment, then give your partner a massage yourself at home. Celebrating someone's birthday is often about serving the person. Few things say service like breakfast in bed. Your birthday sweetheart will really appreciate this gesture of love. Cooking dinner for your partner is also a good idea. Try making his or her favorite dish. Don't forget about dessert. A cake with candles is the traditional choice, but a cupcake with a candle is also fun. Turn your partner's pantry and fridge into a tribute to all their favorites for a romantic birthday surprise. Rearrange the shelves so you have some empty space along the front of each one. Add in your love's favorite snack foods, candies, drinks, and ingredients so everything they see is something they love. Get even more personal by adding DIY custom labels featuring the reasons you love your partner for each food item. If your idea of a romantic birthday includes making love, start it off by having the birthday person "unwrap" you. Having your partner remove your clothes or "wrapping" will be a thrill for both of you. Give your partner some love coupons. Each coupon entitles your partner to an activity (or to a night off from an activity). You can write the cards yourself, choosing things you know are meaningful to your partner. Getting away from the distractions of home for a night is a great way to enjoy a birthday. Try to find a hotel near you that has nicer rooms, such as soft bedding, amazing views, or a Jacuzzi tub. Some hotels even have romance packages that include things like champagne and chocolates. If your lover is into video games, one creative romantic birthday idea is to create virtual versions of yourselves in a video game. Look for a game where you can make your own characters and customize them to look like you and your partner. In some games, you can make your characters a couple, while in others you'll want to create a guild or group you can be in together. This gives a romantic, personal touch when you play a fun game together or on your own. Enjoying a romantic birthday requires some planning, but it is well worth the effort. Keep in mind that romance is about the two of you being alone, so don't plan a large party. However, it is a birthday, after all, so don't put romance above fun.